Where: 248 W 71st Street, New York, NY 10023 - 1st trimester; 115 East 9th Street, 12P, NYC, 10003 - 2nd trimester; 99 University Place, 4th Floor, New York, NY 10003 - 3rd trimester. Tuition: $450/ 10-week course/ trimester; Registration: $25/course (waived for candidates in training) - can be paid by CC via PayPal - follow the link: PayPal.Me/ORINYC . Ask for our need-based scholarships and payment arrangements (call the administrator at 646-522-1056). This class is a group supervision experience, in which students respond deeply to each others’ clinical work, and also risk sharing their own clinical work in order to get meaningful feedback. The course is entitled “The Analyst as Instrument” because the focus is on how the clinician uses his/ hers own feelings, thoughts, sensations, and perceptions in each therapeutic session as an avenue to the most acute understanding of their patients (or clients). Students learn through firsthand sharing of clinical struggles what is deflected and projected out from the patient’s internal world. This approach is based on work of generations of object relations theorists, originally derived from the British object relations school. This approach stems back to Melanie Klein’s concept of projective-identification, Paula Heimann’s understanding of countertransference, Heinz Racker’s contribution on “concordant” and “complementary” countertransference, as well as on Wilfred Bion’s views on translating concrete unprocessed “beta” elements (enactments) into symbolic “alpha” communication, which involves of processing projective-identifications as an integral part of countertransference phenomenon. Further contributions were made by the representatives of the British school, such as D. W. Winnicott (in his paper on “Hate in the countertransference”) and by the American theorists who wrote about ‘subjective” versus “objective” countertransference (Otto Kernberg, Lawrence Epstein, and Jeffrey Seinfeld). The basic idea is that everything that a psychoanalytic object relations clinician experiences while in the room with the patient can be mentally (Peter Fonagy’s “mentalization”) and symbolically processed, so that it is understood in terms of core traumas and conflicts within the patient’s internal world, which are enacted upon the therapist, because the patient cannot contain and consciously experience his/her own traumas and conflicts. Whatever is said by the patient is then seen as secondary to what the patient might be enacting at any one moment, especially in relation to a core developmental arrest trauma that disrupted basic self integration and separation-individuation. This approach is critical with character disordered patients, as their psyche does not operate on containing repression; this results in compulsion to propel their own internal experience out into the other they are with, inducing feelings in the therapist of being either the traumatizing parent (part object) or the traumatized child self (part self). Object relations theories help therapists to process those projective-identification experiences, so that they can understand the traumatic disruptions in patient’s core, stemming from the time of the early pre-oedipal parent-child sadomasochistic enactment. For all patients, it is essential that their analysts understand/ feel how to be "in their skin". In the case of neurotic patients, verbal associations do reflect such feelings in terms of core conflicts. Thus, the understanding of these symbolically meaningful verbal associations and memories allows the therapist to understand the patient’s core conflicts, as they are continually retriggered in the unconscious areas of a repressed psyche. Participants of this course will also benefit from the mere experiential learning of how to process "objective countertransference," and such concepts as transitional space, transitional object, holding environment, psychic container, and projective identification. To analyze how the patient/client may be operating with dissociated trauma in their internal world; trauma that they need to re-own, feel, and understand – in order to heal, and in order to continue their development. To comprehend the distinction between dissociation and splitting (due to preoedipal developmental arrest) and repression and defenses against psychic conflict (in neurotic patients). To experience firsthand, through the group sharing process, how each person in the group is struggling with the same clinical and developmental distinctions. Also, for students to use the group to learn through others, as well as through their own presentations. For group members to learn through empathy and identification with one another about how intrapsychic and internal world phenomena can be processed into meaningful symbolic understanding. Also, to generally understand the developmental process of mentalization, so that the inchoate enactments can be formulated into communicable relationship terms. Epstein, L. (1977). The therapeutic function of hate in the countertransference. Contemporary Psychoanalysis, 13, 442-461. Fonagy, P., Gergely, G., Jurist, E. L., & Targe, M. (2004). Affect regulation, mentalization, and the development of the self. New York, NY: Other Press. Freud, S. (1917). Mourning and melancholia. Collected papers (Vol. 5). New York: Basic Books. Heimann, P. (1950). 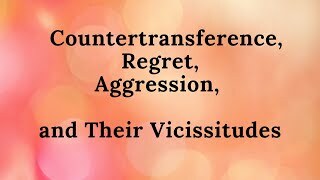 On countertransference. International Journal of Psycho-Analysis, 31, 81-84. Heimann, P. (1960). Counter-transference. British Journal of Medical Psychology, 33, 9-15. Kavaler-Adler, S. (1990). Supervisor as internal object. Psychoanalysis and Psychotherapy, 8(1), 69-76. Kernberg, O. (1975). Borderline conditions and pathological narcissism. New York: Aronson. Kernberg, O. (1980). Internal world and external reality. New York: Aronson. Klein, M. (1940). Mourning and its relation to manic-depressive states. Love, guilt and reparation and other works 1921-1945. London, UK: Hogarth Press, 1980. Klein, M. (1946). Notes on some schizoid mechanisms. International Journal of Psychoanalysis, 33, 433-438. Klein, M. (1957). Envy and Gratitude. New York, NY: Basic Books. Ogden, T.H. (1986). The matrix of the mind. New York, NY: Jason Aronson. Racker, H. (1957). The meaning and uses of countertransference. Psychoanalytic Quarterly, 26, 303-357. Sandler, J., Dare, C., & Holder, A. (1973). The patient and the analyst: The basis of the psychoanalytic process. London, UK: Allen & Unwin. Sandler, J. (1976). Countertransference and role-responsiveness. International Review of Psycho-Analysis, 3, 43-47. Segal, H. (1952). A psychoanalytic approach to aesthetics. International Journal of Psychoanalysis, 33, 196-207. Segal, H. (1973). Introduction to the work of Melanie Klein. London, UK: Hogarth Press. Segal, H. (1981). The work of Hanna Segal. New York, NY: Jason Aronson. Segal, H. (1985). Chapter 3: The Klein—Bion Model. Models of the Mind: Their Relationships to Clinical Work, 35-47. Madison, CT: International Universities Press. Seinfeld, J. (1993). Interpreting and holding: The parental and maternal functions of the psychotherapist. New York, NY: Jason Aronson. Winnicott, D.W. (1949). Hate in the countertransference. International Journal of Psycho-Analysis, 30, 69-74. Winnicott, D. W. (1960). Countertransference. British Journal of Medical Psychology, 33, 17-21. Winnicott, D.W. (1965). The maturational processes and the facilitating environment. New York, NY: International Universities Press. Winnicott, D.W. (1971). Playing and reality. Middlesex, UK: Penguin Books. Read more about COUNTERTRANSFERENCE as the useful tool in analytic work HERE. Read more about PROJECTIVE IDENTIFICATION as the useful tool in analytic work HERE. 2012 Conference on Self-Sabotage: Jungian, Kleinian, and Fairbairnian Perspectives. Visit ORI's YouTube Channel, ObjectRelations2009, to view NEW mini-video series "The Object Relations View"
Intro to the Object Relations Thinking and Clinical Technique - with Dr. Kavaler-Adler (part 1). Support Our Cause on FACEBOOK: Support Mental Health Education! Object Relations Institute for Psychotherapy and Psychoanalysis (Training Foundation) is a 501(c) (3) nonprofit educational organization. EIN # 133697333. Your donations are tax-deductible, while they help tremendously to keep down the costs of our training and to continue to offer free educational activities and events. provide medical or any other health care advice, diagnosis or treatment. Copyright © 2000 Object Relations Institute, Inc. All Rights Reserved. Website created by MindMendMedia (last updated on 05/28/2016).